Clay Aiken – An Amazing Day ! 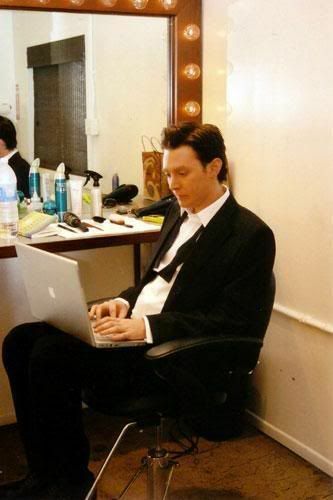 Tuesday, February 16, 2010………….What an amazing day for Clay Aiken fans. What do mean, the best seats available are in the last row of the balcony? No tickets match my request……..except balcony, in the corner!! Finally, some OK tickets…….must compromise and purchase these! Does that sound anything like your day?? Yet, it was a wonderful day. Clay was on-line for hours, trying to solve our problems and answering our questions. We learned that Brian, a part of “Team Clay” worked above and beyond to help with all the glitches. But the best part of the day was realizing that even if our seats aren’t the very best, we will be seeing and hearing an extraordinary concert on March 12th. To a Clay Aiken fan, there is nothing better than seeing Clay live, in concert. The relationship between Clay Aiken and his fans is very special. There is no doubt that he cares very much about his fans and their wants and needs. He lets us get away with so much. I know of no other artist that allows and encourages “Clack” at concerts and doesn’t mind that half the audience in engaged in a cellcert. I just hope that every one of us will understand when he asks us to abide by the rules for this concert. The concert and TV special is about Clay Aiken. It is not about Clay Aiken’s enthusiastic fans. So, when he asks us to put all phones away, leave our cameras and videos cameras at home and not to wear clothing that is fan-centric, we need to be extra careful to follow his requests. If he doesn’t want binoculars in the first 6 rows, we don’t get to argue with him and suggest that it’s not fair because you can’t see. I feel for anyone who has visual problems, however, you will be there in person, you get to hear Clay sing and when you want to see the freckles on his face, watch it on TV. This is Clay’s night. We need to do everything we can to support him and make him even more proud of his fans. I loved going to E-bay and seeing the auction for the VIP package. These tickets will bring much-needed money to The National Inclusion Project. Unfortunately, I didn’t win the lottery so I will have to miss out. However, as an orchestral musician, sitting through the dress rehearsal would be a dream come true. So far, fans are coming to the concert from 25 states, three Canadian provinces and from Asia. Isn’t that amazing? The past couple of weeks have been so much fun. And we have so much more to look forward to! Is it March 12th yet? Congratulations to all the Clay Aiken fans who navigated through TM yesterday to get their tickets!! March 12th is going to be an amazing night for all! Can't wait for this performance to actually be on my TV at a later date!!! Wonderful blog! This is so important for Clay…and I see nothing in the things he has asked of the fans that isn't totally reasonable for a TV taping. I hope every fan reads this blog, and follows his wishes. He shouldn't have to worry about inappropriate behavior ie…taping a show that is going to air on TV. I can wait until June to see it on my TV. I so agree…This PBS Special is such an important step in Clay's career. He's been away from the public eye, since Spamalot…and I feel that this is so important to Clay… He is so excited, and you can tell from his posts…. Clay is coming back to us in a special and with a new CD… I am thrilled for him and us. This is going to be wonderful! How excited I am for Clay, and for us. I hope everyone behaves like responsible, sophisticated adults and that no one, especially Clay, finds any embarrassing situations at this sure to be wonderful event. I know I'll be on my best behavior and I hope everyone else will be too. I pledge not to bring any cellphone or recording device or any Clay ‘paraphenalia’ (what a big word) and follow all the rules to the hilt. Thanks for this amusing and informative blog. So glad there will be professional DVD. Cute blog today………it pretty much relates how my day went. I do hope that people will respect Clay enough to follow the rules. I would hate for Clay to be embarrassed. Got my tickets. Can't wait for March 12th! All very very funny, but true. Clay Aiken still has it and can still sell tickets!! What a great blog!!!!!! I know Clay will knock it out of the park! There's nothing like a Clay Aiken concert (or appearance of ANY kind for that matter)! Excitement is in the air – both on Clay's part AND ours! Congratulations to all the fans who had to go to TM Hell yesterday to get your tickets. This PBS Show will be the best….and, I can't wait for the Special to air in June. I will also want to buy a DVD, if they are available. Clay Aiken is The Man!! Cant wait for March 12. I sure hope people think of Clay's feelings and not themselves. Loved the blog today. So true and now it sounds funny after being stressed to the point of a near heart attack yesterday. It is all worth it and I can't wait to meet a lot of Clay friends in Raleigh. Now I can't wait, can't wait for that very important date! Major woohoos! Even though it sounds like it was a nightmare with TM, it is so good to be able to look for Clay tickets again on TM. This night is going to be very special to Clay and I hope everyone adheres to the rules in place for this special taping. I can't wait to see everyone. I thought I was the only Clay fan that got a ticket for the last row in the balcony even though I was on the computer at exactly 12:00 pm! Maybe PBS doesn't want Clay's rabid fans in the area that the cameras will scan during the performance? Oh, well, I'm just happy to have a seat and I will bring my binoculars. We can always donate to the PBS auction and get a copy of the concert on DVD when the time comes. The ticket tango was a nightmare, but oh so worth it. Bring on the tour and more ticket stress. I welcome it gladly. Error: Error validating access token: Session has expired on Tuesday, 21-Aug-18 16:13:01 PDT. The current time is Wednesday, 24-Apr-19 21:23:55 PDT.